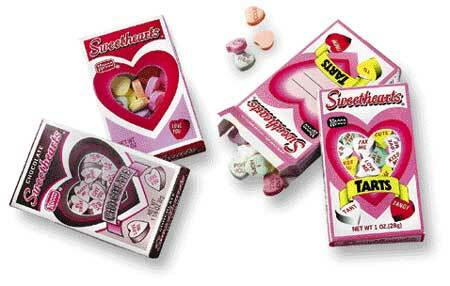 It’s impossible to imagine a Valentine’s Day without the ubiquitous Necco Sweethearts conversation hearts. They’ve been around for over a century, and I’ve got to say, they taste like it, too! I guess it’s kind of like those holiday fruitcakes–hardly anyone actually likes them, but nevertheless they feel obligated to buy or consume them. The recipe for Sweethearts conversation hearts has remained unchanged, but they do offer some other choices. There are Sweethearts Sugarfree Boxes, chocolate-flavored Sweethearts, Sweethearts Valentine Gum, conversation hearts with sayings in Spanish, cinnamon jelly hearts, and Sweetheart Tarts. For “research purposes” I picked up some of the Sweetheart Tarts, which, according to the box, are “tart” and “tangy.” I have to confess that I was a little apprehensive. I’ve had plenty of candies that claimed to be sour and tart but fell flat. I was also imagining the taste of the regular Sweethearts with a teeny bit of citric acid or something added to it, and, well, it just wasn’t very appetizing. I was pleasantly surprised when I finally gathered up the nerve to try these hearts. They aren’t extraordinarily tart, but they are actually tart! And they actually have some flavor! They do have that same hard, slightly chalky texture, but they are definitely edible. There is one color that tasted medicinal (I think it was the white one, but I had several in my mouth so I could not pinpoint the culprit), but that was the only one. 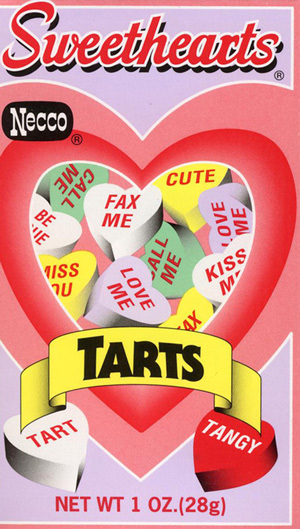 If you must have conversation hearts for Valentine’s but don’t care for the original flavor, give the tart ones a try! It couldn’t have been the white ones with the medicinal taste – they are pineapple and practically taste like real fruit! I suspect it was the fake grape purple heart. I like conversation hearts, really I do. I like the chalky taste. It may have been the green ones. They still taste like soap, and the added tartness makes then taste even soapier.